This is an easy slow cooker recipe that is delicious and versatile. Serve this as filler for any mexican dish, including Sopas, Chalupas, Enchiladas, Garnachas, or even Nachos, in addition to the options above. Or skip the tortillas and serve on a bed of lettuce for a healthier option. Or just serve it by itself in a bowl or with toppings (as shown in the pics). In any case, it is delicious! Place the roast inside a slow cooker. In a medium bowl, stir together the beans, 2 cans of peppers, chili powder, cumin, salt, oregano, and garlic powder. Pour the mixture over the roast. Then pour on enough cups of water to mostly cover the roast. Move the roast a little to get some of the water underneath. Cover, and cook on Low for 8 to 9 hours or on high for 5 hours. Check after about half way through to make sure the beans have not absorbed all of the liquid. Add more water if needed. Use just enough to keep the beans from drying out. When the roast is fork-tender, remove it from the slow cooker, and place on a cutting board. Remove any bone and fat, then shred with forks. Return to the slow cooker, and stir in the remaining can of green chilies. Heat through, and serve with tortillas and your favorite toppings. We used cilantro, avocado, tomatoes, and salsa. I thought this was wonderful. We served this on crispy whole wheat tortillas with lots of healthy toppings. 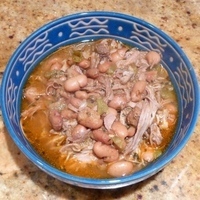 This recipe made my mouth water, going to the store to pick up a pork roast! I no longer believe in the slow cooker. Everything that comes out of it tastes exactly the same. A good heavy pot and a very low oven does a better job.